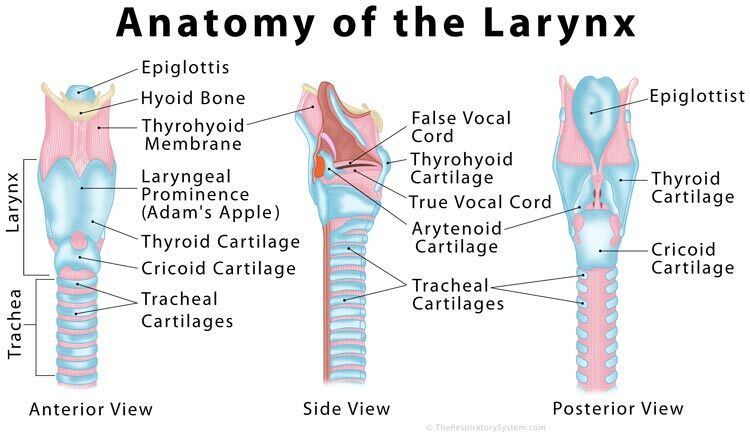 The larynx, commonly called the voice box, is a 2-inch long cartilaginous tube connecting the back of the nose (pharynx) and the windpipe (trachea) with each other. It is one of the most important structures of the respiratory system, also playing a crucial role in the production of speech in humans . The flexible structure is located at the anterior side of the neck, in front of the pharynx and above the windpipe . Suspended from the hyoid bone, it extends from C3 to C6, opening into the laryngeal portion of the pharynx . It is made up of multiple pieces of tough cartilage, surrounded and held together by fibrous tissues, membranes, and ligaments . The largest cartilaginous segment is called the thyroid cartilage, with a prominent bulging known as Adam’s apple. The semicircular structure has a raised ridge on its anterior surface, which is larger in men, making the Adam’s apple more visible . 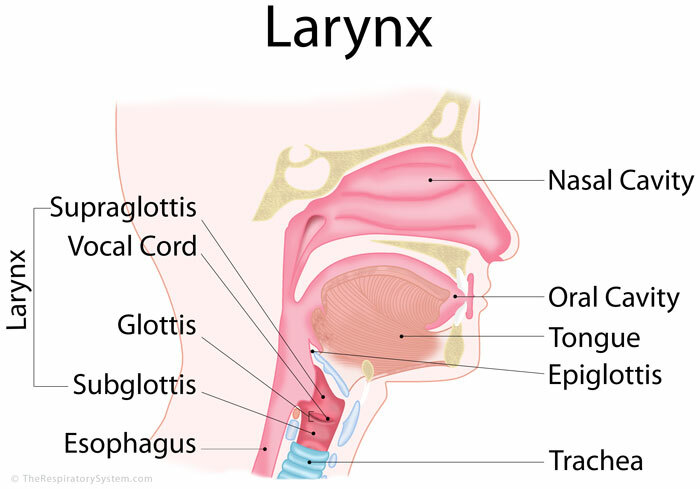 Glottis: The area consisting the vocal cords or folds; there are two pairs of vocal folds (mucous membrane structures) in the larynx, the false vocal folds and the true vocal folds . The former is covered with respiratory epithelium, while the latter has stratified squamous epithelium covering it. The open space between the vocal cords is called rima glottidis, which varies in size depending on the function of the larynx . Subglottis: The lowest part, extending from below the vocal cords, with the cricoid cartilage continuing into the windpipe . Superior laryngeal artery: Branching out from the superior thyroid artery (STA), it runs through the thyrohyoid membrane (or hyothyroid membrane) to provide for the laryngeal glands, muscles, and mucous membrane . Inferior laryngeal artery: Originating from the inferior thyroid artery (that arises from the thyrocervical trunk), it enters the larynx through the space between the trachea and esophagus, alongside the recurrent laryngeal nerve . Superior laryngeal vein: Empties into the superior thyroid veins, which then drain into the internal jugular vein (IJV) . Inferior laryngeal vein: Empties in the left brachiocephalic vein, through the inferior thyroid veins . Both the laryngeal veins use the same path as the laryngeal arteries . The lymphatic vessels draining above the human vocal folds follow the superior laryngeal artery to empty into the deep cervical lymph nodes. The vessels draining below the human vocal folds follow the inferior thyroid artery to empty into upper tracheal lymph nodes . Suprahyoid group: Consists of the digastric, geniohyoid, mylohyoid, and stylohyoid muscles that function collectively to lift the larynx . Infrahyoid group: Contains the omohyoid, thyrohyoid, sternohyoid, and sternothyroid muscles that help to lower the larynx and the hyoid bone . The intrinsic muscles are located within the larynx, where they control the tension upon the rima glottidis as well as the vocal cords . This group includes the thyroarytenoid, cricothyroid, posterior cricoarytenoid, transverse arytenoid, and lateral cricoarytenoid muscles . All these muscles are in matches of a left and a right muscle, except for the transverse interarytenoid . Superior laryngeal nerve: Arising from the vagus nerve’s inferior ganglion  , the superior laryngeal nerve has two branches – internal and external. The former innervates the Supraglottis, providing general sensation to the area . Recurrent laryngeal nerve: Originates from the vagus nerve, and provides motor intervention to the intrinsic laryngeal muscles. The infraglottis receives sensory innervation from the RLN . The respiratory and digestive systems separate at the larynx, making it a vital organ in the function of both. Another primary function of the voice box is producing sounds and speech. Function in the respiratory system: Providing smooth passage of air from the nasal cavity to the lungs. During inhalation, air enters through the nasal cavity and mouth, traveling through the pharynx, larynx, and bronchi (the two primary branches of the trachea) to finally reach the lungs . Function in the Digestive system: It also plays a vital role in channeling swallowed food into the esophagus, as the epiglottis covers the entrance to the larynx, keeping food and drink from entering the windpipe . Once the food passes into the esophagus, the epiglottis goes back to its original position to facilitate the passage of air . Function in speech production: There are two pairs of vocal folds (mucous membrane structures) in the larynx, the false vocal folds and the true vocal folds. Vibrations of the true vocal folds allow humans to make sounds such as speaking and singing, while the false vocal folds are responsible for resonance. Change in the vibration speed and tension of the vocal fold varies the pitch produced . 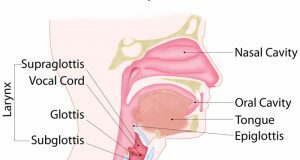 Laryngitis (inflammation of larynx): Usually occurring due to some viral infection, along with the common symptoms it may lead to swollen glands around the throat, pain, burning sensation, swallowing difficulty, flu-like symptoms, tiredness, and a mild fever . Fractured or dislocated larynx: Can result from a severe direct blow to the neck or throat, such as during some sport or due to a car accident. May turn life-threatening due to serious airway obstruction . Laryngopharyngeal reflux: A condition similar to GERD, where the stomach contents come back up the esophagus into the larynx, but with different symptoms than GERD, making it harder to detect. More common in newborns due to their underdeveloped esophagus and sphincters, the symptoms may include hoarseness, chronic ‘barking’ cough, apnea, and difficulty feeding . Adults may experience a bitter taste or burning sensation at the back of the throat, and heartburn (rarely) . Laryngospasm: A short, but sudden spasmodic closure of the larynx, often occurring during inhalation, when the larynx closes and blocks the air in the lungs, making one unable to breathe or speak. Although quite scary, it goes away on its own within a few minutes . Irritable larynx syndrome (ILS): Characterized by pain, a lump in the throat or neck, swallowing difficulty, occasional laryngospasms, and cough, ILS may occur due to chronic GERD or some neurological condition . Abnormal growths on larynx: Some people may develop abnormal cysts, granuloma or polyps on the larynx, leading to pain, hoarseness, and difficulty swallowing. Laryngomalacia (floppy larynx syndrome): A congenital malformation of the larynx, where the laryngeal tissues are soft and floppy, blocking the airway partially, leading to noisy breathing in newborn infants. In most cases, the problem goes away within 1.5-2 years without surgery . Laryngeal Cleft: Another congenital disorder where there is an abnormal gap between the larynx and esophagus, increasing the chances of food entering the lungs, leading to various feeding and breathing difficulties . Diagnosis of these conditions often involves physical examination, as well as tests like larynx biopsy, CT scan, ultrasound, and X-ray. Treatment measures like steam inhalation and resting the voice are often enough to manage the minor issues, while infectious diseases may need antibacterial or antiviral medications . In rare cases (e.g. larynx cancer), partial or complete removal of the larynx may be done through surgical procedures like endoscopy and laryngectomy . Modern medical procedures have made it possible to have successful larynx transplants in a few cases.